Rutland DR celebrate their PFA Minor Cup final win. There were defeats for the two local sides playing in county cup finals last night (April 22). 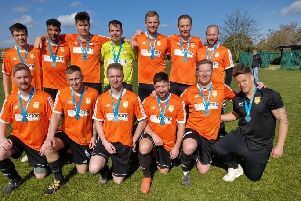 Premier Decorators from the Peterborough Sunday Morning League were beaten 3-2 by Catworth in the Hunts Sunday Cup final at Godmanchester while Moulton Harrox lost 2-1 after extra-time to Hykeham Town in the Lincs FA Senior Cup final at Sincil Bank. Premier Decorators, playing their final season in the Peterborough Sunday Morning League, were unhappy with the officials and claimed two of the Catworth goals were offside. Lee Kenealy saved a penalty for Moulton Harrox and it was 0-0 after 90 minutes. Hykeham went 1-0 up with a Matt Easton goal and then Macauley Grimwood equalised for Harrox. But Josh Raby headed home from a corner to clinch it. In the PFA Minor Cup final at Chestnut Avenue, Rutland DR beat Peterborough League Division Four rivals ICA Sports B 3-1 thanks to goals by Tane Scott (2) and James Slack.